Is there financial support available to “non-relative extended family members” (NREFM) who take a child through an emergency placement prior to the individual being approved as a resource family? Background: Assembly Bill (AB) 110 and AB 1811 provide emergency caregiver funding to California families who accept placement of a child in foster care on an emergency basis or based on a compelling reason prior to completing resource family approval (RFA). AB 110 went into effect on March 30, 2018 and was set to expire on June 30, 2018. AB 1811 extends the funding initiated under AB 110, so that families benefitting from AB 110 will continue to receive emergency caregiver funding. AB 1811 also provides funding for families who accept placement on or after July 1, 2018 and are not yet approved as resource families. A: Until recently, NREFMs did not have a guaranteed source of financial support while they were caring for a foster child on an emergency basis and completing Resource Family Approval (RFA). 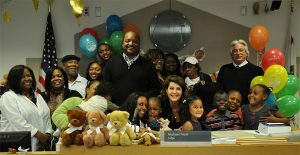 AB 110 and AB 1811, commonly referred to as emergency caregiver funding, now provides foster care funding to families caring for foster children while completing RFA. Both relatives and non-related caregivers are eligible to receive emergency caregiver funding equal to the resource family basic rate of $960 per month per child. More information about emergency caregiver funding may be found here. Welfare and Institutions Code §11461.36; All County Letter (ACL) 18-75. ← As a relative caregiver for a child who is receiving regional center services, the benefits I receive keep changing. What is my family eligible for?